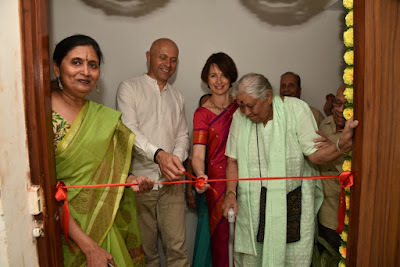 Annapurna Pariwar, the Pune-based NGO working for women empowerment through its micro finance and other support services inaugurated its new office premises on 7th May, 2018. The new office building Su Vastu Prestige is located minutes away from its earlier office at Warje, Pune and will house the entire back office staff along with the CEO and Senior Team. The new premises was inaugurated at the hands of Com. Shri Krishna Mense, the veteran freedom fighter who was also the founder member of Annapurna Mahila Coop Credit Society Ltd. in 1986 along with Padmashri Prematai Purao. Speaking on the occasion, Com. Mense highlighted the role played by cooperatives in the development of good business practices and creating self-employment. Dr.Medha Purao-Samant, the CEO of Annapurna Pariwar expressed happiness that the credit society can now boast of its own office acquired with financial support from Indian Overseas Bank, Bank of Baroda and Bank of Maharashtra. The guests present on the occasion included bankers, auditors and noted dignitaries like Dr. Anil Avchat, Mr. F. X. Hay who lauded the organization’s efforts which made the new premises a possibility. This was especially creditable as it was achieved with Annapurna’s goals of empowerment of poor women by upholding a sustainable yet not profit-oriented model of comprehensive development.